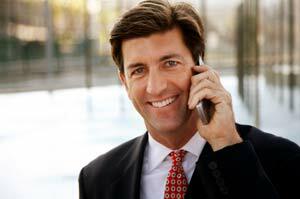 Hire professional voice over talent for your voice mail greetings and telephone use! You and your company should sound just as good as your image in print, on the Web, and on radio and television! Voice mail greetings, directory listings, voice prompts, and auto voice attendants. IVR voices for large Corporate Phone trees or voices for TTS or SR.
Answering machine messages and/or cell phone voice mail greetings and recordings. On hold promotional messages as callers are placed on hold with or without music. Telephony broadcast messages and/or political announcements for auto dialers. Professional voice overs for 1-800 or 1-888 telephone advertising messages. These are voice messages that automatically start playing when a prospect calls your 800 number. Virtually anything you might require a voice over for in telecommunications can be created in our studios. Listen to voice over talent demos now! When you need professional phone voice overs that your callers will enjoy hearing and will communicate your uniqueness and professionalism, think of Marketing Mania. We provide voice over talent who specialize in on hold voice overs. We are your "On Hold Voice Over Central". We are your "one stop" voice over talent resource to listen and choose from top world talent in over 48 languages. We provide voice overs for simple on hold messages and voice mail greetings to complex Interactive Voice Response applications. Just pick from the demo voice overs below to hear selections from our voice over talent professionals. There are many different uses for telephone voice overs or on hold voice overs including voice mail greetings, voice prompts, Interactive Voice Response (IVR), phone trees, voice over IP mail boxes, phone attendants, or on hold promotional messages. Our services can be used for any telephone voice application need. We can offer just the voice overs or provide full post production including naming, editing and converting the voiceover audio according to your phone system needs. For both on hold voice overs or any voice over recording, we can also help you with your music selection and the mixing of music to complement your voice overs. If you have a small voice mail system or just one phone greeting, we can even studio patch the voice mail greeting right into your voice mail using our specialized voice mail patching equipment. Having trouble developing your on hold voiceover script? Get our on hold script writing template which will assist you in writing your on hold promotional narration voice over script. Purchase the script now for $9.99. We invite you to listen to voice mail greetings and telephone voice over demos and choose a voice over talent from our lists. For foreign languages, visit our language page to select your language talent first. Then, name your voice over talent selection or ask for free voiceover casting by filling out our telephone voice overs rate request form. We have a FAST turn around! Get Rates on Voice Mail Greetings, On Hold Voices, Etc. With or without music and sound effects (we have over 30,000 effects to choose from). Via Internet in your choice of audio file(s) suited to match your particular system. Studio patched in remotely from our sound studios. Sent on compact disc (CD) in any audio file format you need. For rates, visit our voice overs for phone rates form. Include your script, your voice over talent choice (selected by listening to the demo voice overs), and whether you need music, sound effects, and tones.